This delightful Georgian cottage is one of a picturesque row close to the church and overlooking a quiet square. It is very warm, comfortable and well equipped. Charming enclosed garden which is accessed upstairs through the cottage together with a separate annexe sleeping further 3 people. One of the best locations in Lyme; choice of two totally different beaches- one famous for fossils, each only 2/3 minutes walk. Shops just around the corner. 'Appletrees' is gas centrally heated and provided with everything you will need in the way of bed linen, towels, duvets, pans, crockery and cutlery. In the kitchen there is a 4 ring gas hob and built-in electric cooker, microwave, fridge, freezer and dishwasher. The spacious dining area with long table and bench seats is open through to the lounge, where ample comfortable seating and a Smart 43" 4K TV creates a cosy family room. A door leads upstairs to bedrooms, bathroom and garden. The pretty patio garden is fully enclosed and is, equipped with table, chairs, benches and a pretty arbour with further seating. Across the garden, which is only accessed through the cottage up some steep stairs, is the 'boathouse' which comprises of a double bedroom (with zip and link king-size bed and 32" Smart TV), a single bedroom, shower and laundry. Lyme Regis is a lovely little town with something for everyone. 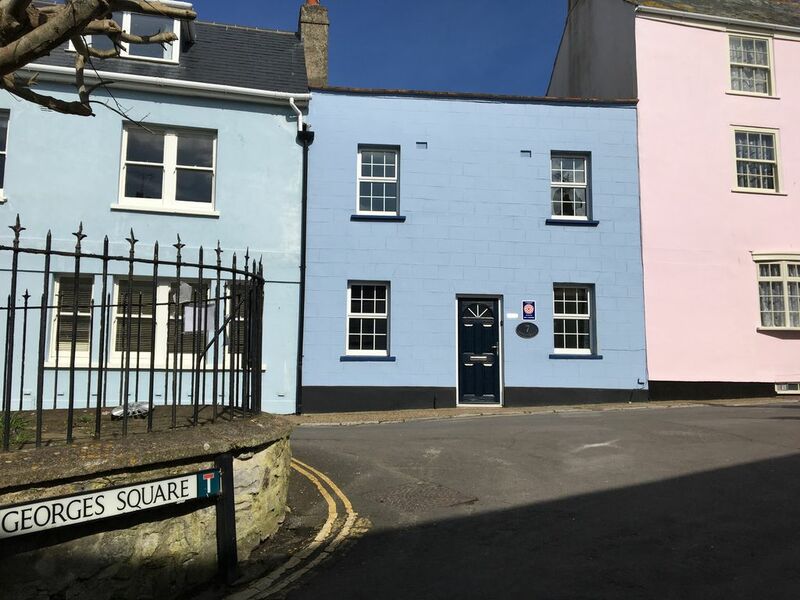 Apart from the attractions of beach, harbour, pubs, cliff top rambles and golf course, the town itself is full of picturesque buildings and little alleyways. Close to 'Appletrees' runs the river, on its way through the town. Here you will meet Lyme's other residents - ducks! My father bought Appletrees as a family holiday home back in the 1950's. As my boarding school was in Taunton it was useful as a holiday get-away. Now with our family grown up we are bringing our own grandchildren down to Appletrees. Appletrees is ideally situated close to the beach, but away from the crowds in the oldest part of Lyme Regis. The wireless/pass key is clearly displayed in the cottage. There is Wi-Fi in both the cottage and the annex. Netflix is available on the two Smart TVs. A Welcome Pack is provided containing a small milk, wine and brownies. Also a starter of teabags, coffee, toilet rolls, plus a few dishwasher tablets. Fully enclosed terraced garden with some steps and we would advise that small children are supervised at all times. Tables, chairs and benches together with a pretty arbour with further seating. Please note that the garden and annex at the back of the cottage are not at street level and have to be accessed up the stairs in the cottage (or via steep stone steps off the kitchen). There is however a toilet downstairs. With regard to the 'suitable for elderly or infirm' please contact the owner. If you wish to bring a pet - contact the owner Water softener. Welcome pack. Smoking allowed in the garden only. We provide a Parking Permit for a local Council Car Park (5 mins walk away). Lyme Regis is the perfect place for a family holiday and Appletrees has been equipped particularly with families in mind. When our children were small, the short level walk to the beach was a huge advantage with its glorious bay of golden sand which curves around and joins the celebrated Cobb and its tiny harbour.Within easy reach of Lyme Regis lie many places of interest. For walkers, try any of the cliff top walks for spectacular coastal views, or travel west to the river Otter or east to fascinating Chesil beach, Abbotsbury Swannery or Portland. For children, try Cricket St. Thomas, Seaton Percorama or Farway Country park. Or, close to home the Seaton to Colyton tramway. The town offers a good golf course, many excellent restaurants and old fashioned pubs and the whole area abounds in traditional tea shops and antique shops. Further afield lie Exeter with its beautiful Cathedral, Dorchester with its iron-age hill fort and Corfe with its extraordinary ruined castle. Golf: Lyme Regis Golf Club recognised as one of the finest golf courses in the south west. The course occupies a cliff top site with coastal views towards Portland Bill and overlooks the historic town and world heritage site of Lyme Regis.